Heyl Town Band are based in the small town of Hayle in West Cornwall, which sits on the River Hayle near St Ives Bay. The band takes its name from the Cornish word for estuary, Heyl. Our badge bears the Cornish spelling of our home town, which in Cornish is spelt “Heyl”. We are a Cornish Band, proud to keep and show our heritage. The present band would be totally unrecognisable to the players and officials when the Band was reformed; this was in the autumn of 1973. Harry Rutter, who was a member of the old Band and had been a councilor for many years, in the course of his duties came across the instruments of the old band. This gave him the idea to try and start the band once again. He found out that in the town, and the secondary school, there were people who had or who were still playing brass instruments. He went around the town and contacted various people to ask if they would be willing to reform a band. The first so-called practice was held at The Laurels, which was the home of another councilor, Mr Leslie Capper. Out of some 20 who had turned up only 3 could play and seeing that there was only 3 instruments that could be used, it was somewhat fortunate. The instruments were from the original band. Every time they were played the connections on the slides kept leaking, so the instruments had to be soldered again to make them playable. Mr Alan Richards was the first musical director, and in the first year we managed to attract players from different areas of the band world. Mr Teddy Irish was appointed as secretary and with his enthusiasm and drive the band started to improve. Captain Tim Richards was the next musical director. A person with a vast amount of musical knowledge, and he put it to good use with the coaching of the players to attain a good standard in music and the understanding of what brass banding was all about. After some time the Catholic Church kindly let us use their hall for rehearsals, and we slowly progressed. With more players coming in to join until eventually with the correct tutoring we were able to have a junior band to complement the senior players. This all took place under firstly Mr Alan Toy and later with Mr Chris Harris. Here we remained until moving to our present band room in St. John’s Street. In 2000 Derek Johnston built Heyl Band up once again into a successful contesting band. Derek was a strong driving force, pushed the band to new levels and not sitting in the past as many bands do. Our track record of 42 contests in the top three and 23 wins over the course of 9 years. 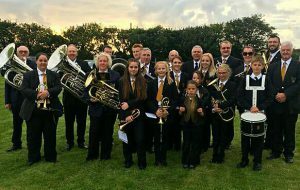 The band got a name for being one of the best entertaining brass bands in Cornwall and has broken into the top two hundred bands in the world. In 2010 Reuben Long took the baton of and kept the band up to standard through some tough times and now takes our junior band. Our present conduct is David Loukes who trained in the Salvation Army becoming Solo Trombonist with the Chalk Farm Band. During his music career he has played a major role in the establishment of the ground breaking courses in Band Musicianship and conduct a range of brass bands including Black Dyke.